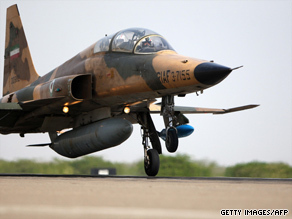 WASHINGTON (CNN) -- A man dubbed "the Field Marshal" by one advocacy group for alleged third-world arms dealing has been arrested on charges that he conspired to illegally export U.S. F-5 fighter jet engines and parts to Iran. An Iranian F-5 fighter jet lands in southern Iran during a military exercise on June 23, 2009. Jacques Monsieur, 56, a Belgium native who currently lives in France, was arrested Friday in New York, officials said. An indictment also charges Dara Fotouhi, 54, an Iranian living in France, with participating in the alleged crime. Fotouhi remains at large, official said. Monsieur pleaded not guilty at an arraignment Wednesday in Mobile, Alabama, where he is being held. He and Fotouhi are charged with conspiracy, money laundering and smuggling, as well as violations of the Arms Export Control Act and the International Emergency Economic Powers Act. According to the indictment and an affidavit filed in the case, both are experienced arms dealers who have been actively working with the Iranian government to procure military items. The F-5 Freedom Fighter, also called the Tiger, is built by Northrop and is used by the U.S. military for training. It is also sold overseas as a combat aircraft. The F-5 engine and parts are listed on the U.S. Munitions List and may not be exported from the United States without a license from the State Department, said John Morton, head of Immigration and Customs Enforcement, and they can not be exported to Iran without a license from the Treasury Department. In a 2002 report by the Center for Public Integrity, a citizen advocacy group, Monsieur was nicknamed "the Field Marshal" for allegedly acting as a middle-man in numerous arms deals with war-torn countries. The center's report said Monsieur is "believed to be among the biggest arms traffickers in Europe" and said he "violated a United Nations embargo by shipping arms to Bosnia and Croatia during the long, bloody conflict in those countries, with the approval, he later claimed, of both the U.S. Central Intelligence Agency and the ... French domestic intelligence service." Morton said his agency launched an investigation in February when Monsieur contacted an undercover federal agent and indicated he wanted to buy engines for F-5 or C-130 aircraft for export to Iran. In subsequent e-mails to the agent, Monsieur requested engines for F-5 jet fighters. Officials said the engines could be used as replacements in fighters sold to Iran by the United States before the imposition of sanctions in 1995. In March, Monsieur met with the undercover agent in Paris and again requested engines and parts, the indictment alleges. They met again in May in London, where Monsieur introduced Fotouhi as a business associate and again discussed the export of F-5 engines to Iran, according to the indictment. During this negotiation, it says, Monsieur and Fotouhi asked the agent if he could use U.S. shipping or export authorization documents that falsely indicated the items were going to Colombia. In July, Monsieur and Fotouhi wired about $110,000 from a bank in the United Arab Emirates to one in Mobile, Alabama, the indictment says. "The two believed the funds would be used for the purchase of F-5 aircraft parts," Morton said. Monsieur indicated he would deposit an additional $300,000 as a down payment for the purchase of two jet engines. "This is part of our long-standing efforts to ensure that sensitive military equipment is not exported in violation of U.S. law and against the international interests of the United States," Morton said.